Vector Security is excited to announce its sponsorship of BK Racing, a professional U.S. stock car racing team competing in the NASCAR Sprint Cup Series. As part of the arrangement, the company will sponsor car No. 83 at the “Pure Michigan 400” race taking place at the Michigan International Speedway on August 28, 2016. Prominently branded with the Vector Security name and logo, car No. 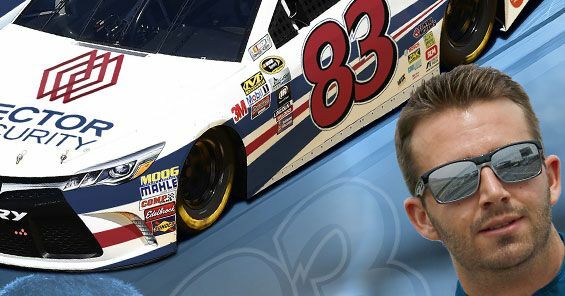 83 is driven by Matt DiBenedetto, who has been racing for more than 13 years and recently captured his first NASCAR Sprint Cup top 10 finish at the Bristol Motor Speedway in Tennessee. BK Racing is a NASCAR Sprint Cup Series team based in Charlotte, N.C. Its staff of more than 60 employees work to field the No. 23 and No. 83 entries in the NASCAR Sprint Cup Series as a Toyota racing team. The NASCAR Sprint Cup Series is the top racing series of the National Association for Stock Car Auto Racing. The series is named for its current sponsor, the Sprint Corporation, and has been known by other names in the past.